The recent WordPress Photo Challenge is about change. When I think about changes, a lot would come to my mind, but then I found a photo in my folders that I shot last year, it’s a photo about two big changes, the divided Germany, and also the German reunification. 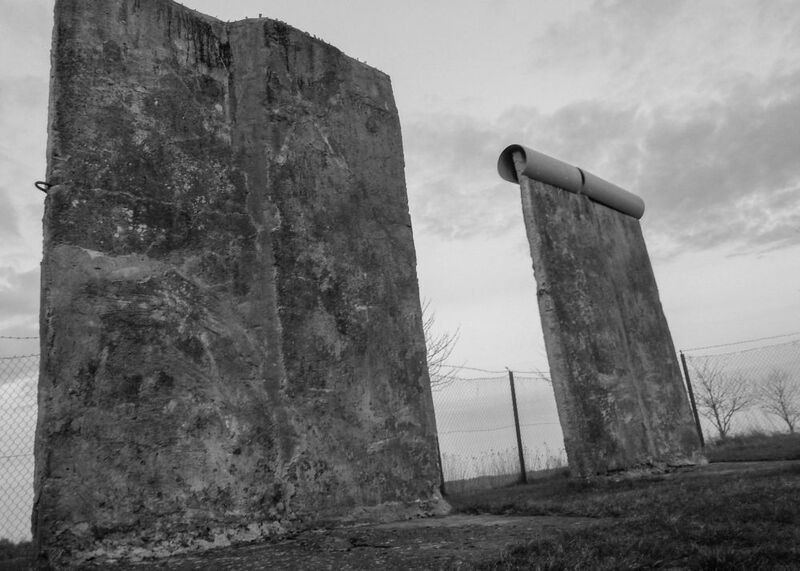 I will show you remaining pieces of the wall that divided East and West Germany. I shot the photo somewhere between the federal states Schleswig-Holstein and Mecklenburg-Vorpommern, not far away from our city Lübeck that was on west side of the border, but pretty close to it. As our city was so close to the border, it’s not hard to find people here that can tell you stories about divided families. What is also interesting, if the pen would have drawn the border a little bit more to the left, our city would have been a city of East Germany back then. Talking about the German reunification, I still remember the days when the border opened, I was 8 years old, something was going on, every family member talked about one subject, every TV channel was the same, we kids tried to grasp what was going on, the adults tried to explain. Then, the next day, suddenly the streets of our city were full of cars that I had never seen before, the adults told us what reunification means, we kids started to understand what it meant, probably not in full historical context, that’s something we learned later. However, as the border was not far away, the adults decided to drive there with us, everyone was curious to check out the death strip. It was afternoon, I remember the dark heaven, all the barbed wires, the big walls, the watchtowers, it was interesting, to me it was something new, but it appeared strange and creepy, and the adults seemed to be depressed, the silence, I felt the sadness. When I asked my mother if we could run over the big field, all adults replied at the same time “No, there can be still mines, they are dangerous!” and they talked about a sign they have read. After that day, and I didn’t know the term back then, people seemed to be in a happy mood, today I’d say they were in a patriotic mood, but in some way people also seemed to be suspicious. Today I’d say, reunification doesn’t happen in a few days, it actually took way more time, the borders made people become unfamiliar with each other, but this border was torn off over time too, that was my impression over the years. That’s how I experienced the German reunification as a kid and the following time. My photo inspired me to write this down, I hope you enjoyed the post, even if it was a more serious subject. Does Merkel Know The Difference Between Meaningful Critique And Hate Speech? That was a very exciting time. The most important thing to happen in the world since the moon landings. I was six when that happened. I remember the protests started in Poland, I think, and before long comunist governments were collapsing all over Europe. It was mostly peaceful too (except Romania) which was unprecedented. Germany then reunited so soon after that, I was amazed at how quickly that happened. I bought a piece of the Berlin wall not long after it came down. I had it for years but don’t know what happened to it. It’s interesting to hear your perspective too… as an 8 years old kid I couldn’t grasp the whole historical scale of this event, that’s something I learned the years after the event, the iron curtain, the Cold War, and about the cause, the World War II… our parents tried to explain what the walls were about, I understood some things, but with this age I probably had not the mindset to understand it right, and not the knowledge to connect it with other events. I agree with you, the years after, when we learned about it in school, I remember the most asked questions were “How did the German reunification not result in a next war?”, we also had the same questions about the Cold War and were lucky to learn that a third world war didn’t happen… when I see documentaries today, and how close we humans were to a nuclear world war catastrophe, it’s so creepy to think about it, and it makes me happy that this didn’t happen, it’s amazing when things end more peaceful with diplomacy. The moon landings were exciting but like you, at six years old, I didn’t understand the historical significance of them. I just thought it was cool. It is very interesting to read about your memories of the event. I remember hearing about it when I was a kid but I never thought about what it was like for the people there. I enjoyed reading this a great deal. I was in Berlin before the wall came down as a U.S. serviceman and the memories of how the city felt during the Cold War are with me to this day. Whenever the Soviets held military exercises to practice taking down West Berlin, they always included a scenario of their Warsaw Pact allies turning on them. The Soviets seemed convinced that the East Germans and the Poles would fight against them if hostilities ever broke out. I never would have dreamed that German reunification would happen peacefully, but when the changes started to sweep through Eastern Europe and the Soviet Union, I had hope. The night the wall finally came down, I was so happy that it happened peacefully. I haven’t been back to Berlin since the wall has been down, but I hope it is something I can do one day. Great post and thanks for sharing your memories. It was very interesting to hear your perspective on this Dennis both as a child and also a German citizen. Over here in Australia it was on the news all the time and people here were very interested and happy that it had happened. For at least a little while the world seemed like a better place. I’m sure reunification was not easy though. When families reunite after many years there are a lot of issues to be overcome and here it happened to a whole nation. Interesting to speculate what your life might have been like if the border had been in a different place. Yesterday when I went to bed after I published the post, I got the idea that I should have ended the post with the question “How did you experience the time?”, I was sad that I didn’t, but today when I moderated the replies, I am happy to see that everyone is sharing their perspectives too, that I didn’t have to ask for it. It’s so interesting to read your stories. Yes, the decade after, I experienced that East and West Germans did also mistrust each other in many cases, but the mistrust did disappear over time. The Cold War lead to different authoritarian education, people on both sides were educated to fight against each other if a war would have broken out. Today I think it’s super amazing that diplomacy was stronger, that the cold war didn’t end in another big war, we kids were amazed when we learned about this in school. What is interesting, the husband of my mother lived in East Germany when Germany was still divided. He and most males in his family served for the National People’s Army, while all males in my family served for West Germany in the Bundeswehr to that time. So, today, whenever there is a family meeting, for example because of a birthday, you literally have people sitting on the table who might have shot each other if this wouldn’t have ended peaceful. What is more exciting, today there is no mistrust anymore, they talk with each other about their experiences, how it was in the Bundeswehr to that time, how it was in the National People’s Army to that time… so, history is literally happening on the table when family comes together, people sit together in peace, they talk friendly about their experiences, that is the outcome and always exciting to see. I wish diplomacy would always be the one and only choice, sadly this is not always the case in our world. It was interesting to hear their experiences, but also different, they were definitely educated more in a “military manner” and obedience than we West German kids.